Martin is well known for his work as a lead player and featured soloist with virtually every big band in L.A. Martin is the lead trombonist and featured soloist with Gordon Goodwin’s Big Phat Band, the lead trombonist and soloist for The Tom Kubis Band, and soloist for the Bill Holman Big Band. He has appeared in bands led by Jack Sheldon, Louis Bellson, Quincy Jones, Matt Cattingub, Bob Curnow, Patrick Williams, and Sammy Nestico, among others. Martin has long been one of L.A.’s most prominent trombonists for commercial recordings, television and motion picture soundtracks and live theater. He has contributed on albums for many popular artists, including the Pussycat Dolls, Coldplay, and Michael Bublé. His television credits include the Grammys, the Emmys, the Academy Awards, the Golden Globes and the Screen Actors Guild Awards. 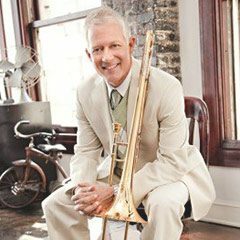 Martin has been the lead trombonist on television shows Dancing With The Stars and American Idol, and has appeared regularly on the soundtracks of major television series such as Family Guy, American Dad, and King of the Hill. His motion picture credits span the soundtracks of over 150 major films, including a project with Grammy Award-winning rap artist Kanye West for the soundtrack of Mission Impossible III.